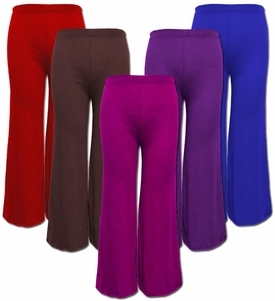 This is a really cute yummy pair of wide leg palazzo pants! They are made from a rayon spandex, but have the look and feel of jersey cotton! Choose from a variety of colors ranging in sizes 4x 5x and 6x. Hand wash, cold water, flat dry, do not bleach. Made in USA. 4x: Waist= 34", Hips= 54"
5x: Waist= 36", Hips= 56"
6x: Waist= 38", Hips= 58"